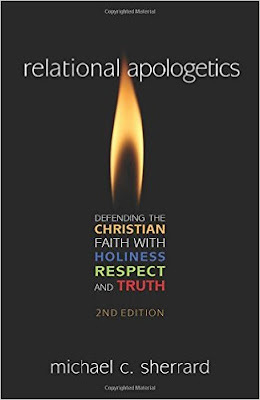 Michael C. Sherrard's new book Relational Apologetics: Defending the Christian Faith with Holiness, Respect, and Truth is an important work that will help any believer seeking to share his or her faith with kindness as well as conviction. It provides wonderful instruction stressing how to communicate and build relationships with those we want to see come to faith, making it an excellent launching pad to teach Christians how to winsomely witness to their family, friends, and co-workers. 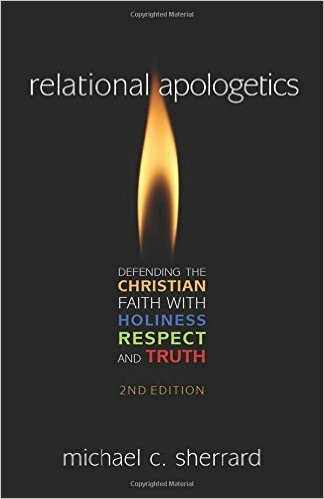 Sherrard opens the book by explaining the important role apologetics plays today. Most people are so unfamiliar with the basic concepts of truth that Christian evangelism strikes them as a foreign language. Thus, apologetics is as crucial in our evangelism efforts as being able to speak a foreign language is to overseas missionaries. It's this concern for how the Christian message is received that makes the book shine. The book is broken into four main sections. The first, Who You Are, coaches the reader on his own character and attitude, counseling "when your lifestyle is holy, evangelism is much less awkward. It starts happening naturally" (p.30). The second section, What You Do, targets the actual interaction with others, emphasizing listening and asking questions as ways to deescalate confrontational engagements ad foster true discussion. What You Know, the third section provides a brief outline of some of the topo objections;/questions believers will face from non-believers. While this is the most apologetic portion of the book, it isn't in-depth but uses the questions more as examples to show how to carry a conversation. The last section, Where You Go, encourages the Christian to step out of his or her comfort zone and engage others wherever they may be found. Helpfully, Sherrard includes two areas, the home and the church, that are not normally mentioned but are traditionally weak in apologetic instruction. The reservations I have with the book are few. First, because of its introductory goal, the chapters are kept short. This limits Sherrard to give perhaps only one example of the point he's trying to develop instead of two or three different examples that the reader may face in real life. Similarly, the third section's outline of the arguments is pretty simple and the reader will need to supplement this book with some others. Sherrard did include a decent list of standard works in the back, but a list of web sites of popular apologetics organizations would have strengthened it more, too. We are in what several apologists have referred to as the "golden age of apologetics. "1 While great new apologetics arguments are being published all the time, there is a new type of book that has started to proliferate that focuses not on the argumentation, but on the communication and delivery. These books include Os Guinness' Fools Talk, Donald Johnson's How to Talk to a Skeptic, and Sean McDowell's upcoming A New Kind of Apologist. Relational Apologetics fits nicely in this group, showing the importance of not only what it is you say but how you say it in order for the message to get through. I recommend it, especially for youth groups and those who would like to know how to begin faith conversations without being flummoxed. 1. See Lee Strobel's comment here or Os Guinness' comment here, both of which refer to this time as a golden age of apologetics.